In just over two months, Chief Master Sergeant James Cody, a career air traffic controller currently at Air Education and Training Command, will become the Air Force’s senior enlisted leader. In an exclusive interview with Air Force Times, Cody outlines his priorities including curbing suicides and sexual assaults, giving airmen more time to focus on their jobs and building trust among airmen. Meanwhile, Air Force Times’ website has been revamped to give you a lot more tools to help you plan your future including allowing you to calculate your re-enlistment bonus and finding jobs in the civilian world that match your area of expertise. 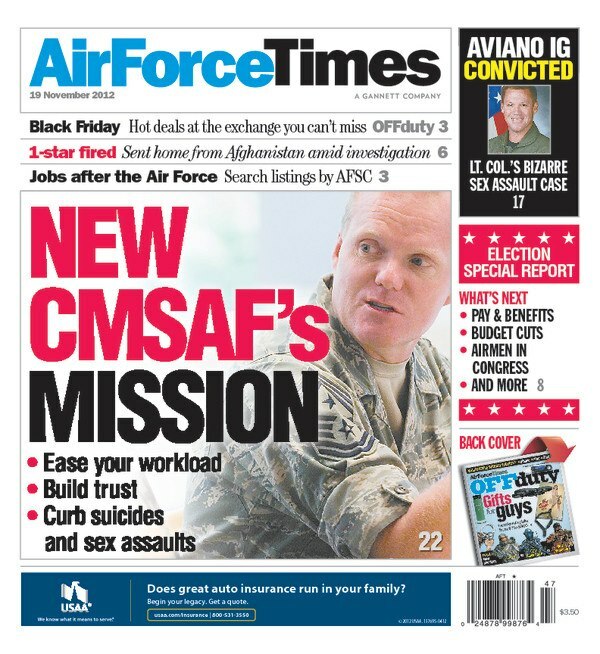 Check out the Air Force “Careers,” “Jobs” and “Education” links on the gray bar just before the Air Force Times logo. Also in this week’s edition: 480 airmen are vying for the top spot in the Global Strike Challenge, in which airmen face a series of stressful challenges to show that they are the best bomber, missile and security forces crews handling the nuclear enterprise. And the former inspector general for the 31st Fighter Wing at Aviano Air Base, Italy, will spend a year in confinement after being convicted of sexually assaulting a houseguest. Read how it all happened.